In Bill Staples's keynote at AzureCon we saw a number of great mobile apps our customers built using Azure App Service. Mike Lorengo from Alaska Airlines spoke about their mobile app, Hopper, which enables their employees to book standby travel directly from their phones. Traditionally, employees had to log into a non-responsive ASP website, but making the move towards becoming a mobile-only company, Alaska Airlines knew they needed a better way for their employees to book. 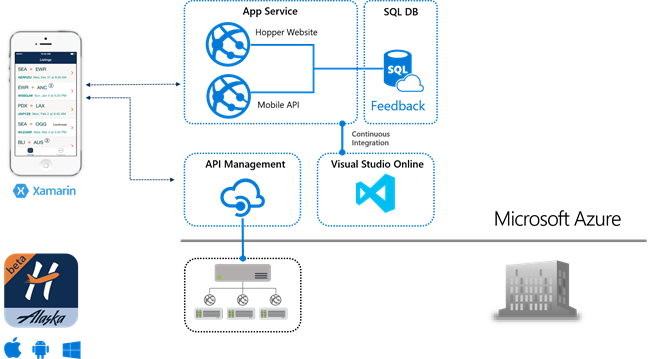 Leveraging Azure App Service, Hybrid Connections and API Management they seamlessly exposed their data to their Xamarin-built iOS and Android applications. In-app feedback implemented using Mobile Apps allows development team to act on improvement requests quickly, while App Service integration with Visual Studio Online and support for continuous integration allows for short release cycles and getting the improvements to users fast. Chris Witmayer from Nascar showed the App Service-powered International Motor Sports Association (IMSA) mobile app for iOS, Android, and Windows. In just under 13 weeks, the team brought together a full backend powered by Azure App Service Mobile (formerly known as Mobile Services) and created Xamarin mobile apps now available on the App Store and Google Play. It provides IMSA fans with stats, live video, IMSA Radio, timing, scoring and more each race weekend. IMSA App uses Azure Notification Hubs to deliver cross-platform push notifications, App Service Web Apps for the companion PHP website, Redis Cache to get things to customers faster, and our partner New Relic for analytics. App Service auto-scale also allows IMSA app to meet the spiky traffic challenge with ease. In my session about building enterprise mobile apps, I talked about an app built by Transport for London’s employees. Transport for London employs a large workforce to manage London Tube operations. Employees need access to vital enterprise resources on the go, from their mobile devices. Transport for London chose Azure App Service as a platform for their enterprise mobile apps, built-in Objective C for iOS devices. One of them, Fault Reporting, allows employees to securely login, using their corporate Active Directory credentials, and report London Tube assets in need of repairs. The app allows employees to work offline and sync with the backend when connectivity is present. Transport For London uses App Service Mobile Apps for authentication, data sync, business logic. Notification Hubs is used for cross-platform push notifications to alert employees of status changes for their reports. App Service Environments and Express Route allows backend to be connected to on premises resources, including a legacy ERP system. App Service WebJobs is used for reliable background processing of the reports. Learn more about how Transport For London and how other customers built enterprise mobile apps in my recent AzureCon session. Alaska Airlines, Nascar, Transport For London and others have built great apps. So can you, and fast! Together with our friends at Xamarin we have made available a number of enterprise app templates utilizing Xamarin Forms and App Service Mobile Apps. Simply head over to Try Azure App Service to experiment with different app templates. No sign-up or credit card needed, within few clicks an Azure App Service will be spun up and you'll be able to download a ready-to-go app connected to App Service. Xamarin CRM. A sales dashboard app to serve the sales force of a fictitious company selling 3D printer hardware and supplies. The app empowers salespeople to login using their corporate credentials, track sales performance, manage leads, view contacts, manage orders and browse the product catalog. The app allows employees to work offline when connectivity is not available and sync changes in the backend. Try it now running on App Service, or get the full template from GitHub. Field Engineer. A mobile dashboard for a field engineer of a prototypical Fabrikam Cable company. The app allows employees to login using their Active Directory corporate credentials, view the daily appointment lists and update their status. The app uses App Service Data Sync functionality to allow employees to make updates offline, and sync with the backend when connectivity is present. The sample offers optional connectivity to the CRM backend. Try it now running on App Service, or get the full source code on GitHub. My Shoppe. 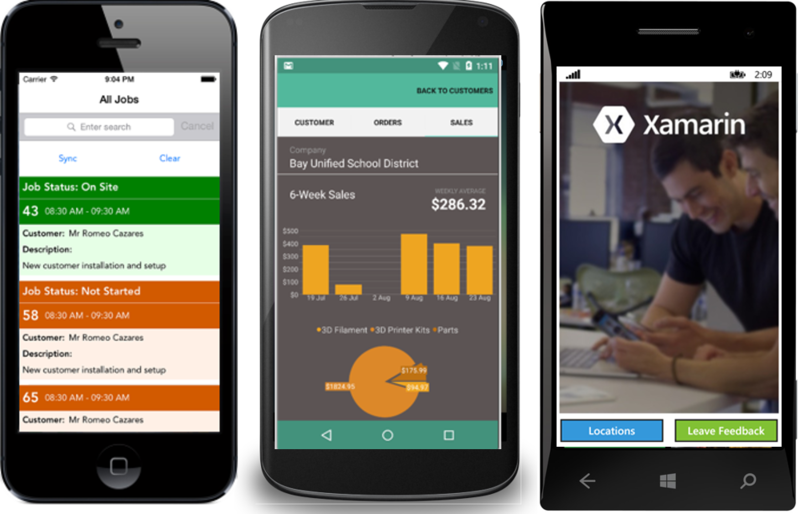 This app by James Montemagno is using Xamarin Forms and App Service Mobile Apps as a consumer facing app of a prototypical store chain. My Shoppe enables customers to browse a list of store locations, find the closest one, call the shop, see shop hours, and even get directions to the shop with a single click. In addition, customers can easily provide feedback on the experience they have in-store. Get the full source code on GitHub. Follow us on Twitter @azuremobile.